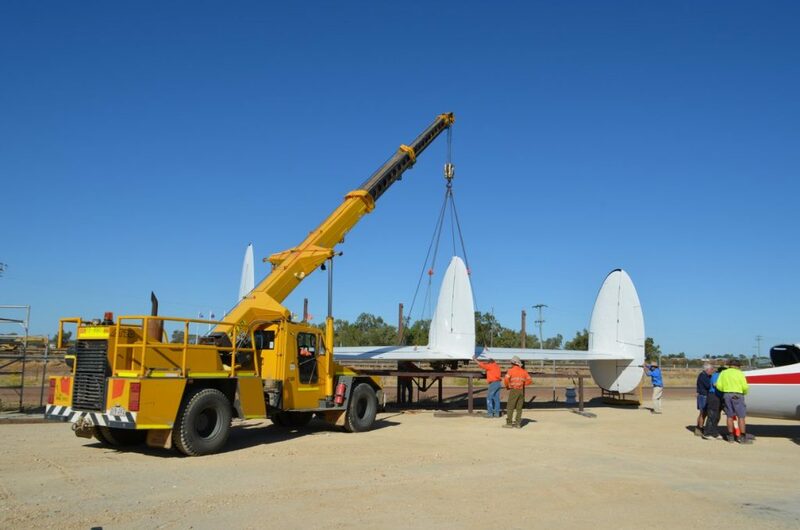 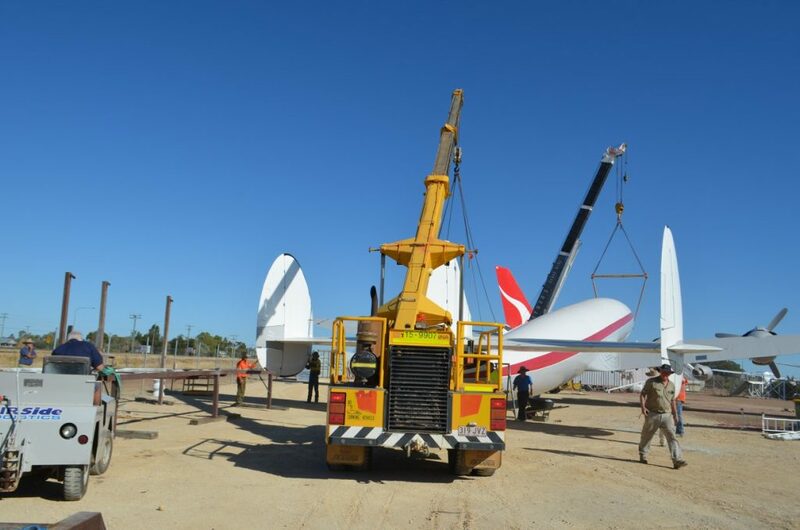 Lifting the fuselage onto stands in preparation for the wings to be attached. 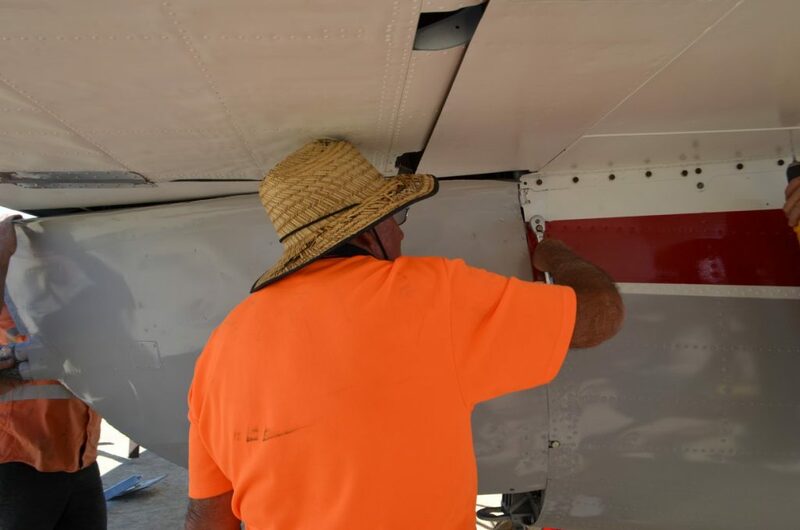 What a difference a year can make in the life of an aircraft when a dedicated team of professionals and volunteers gets to work. 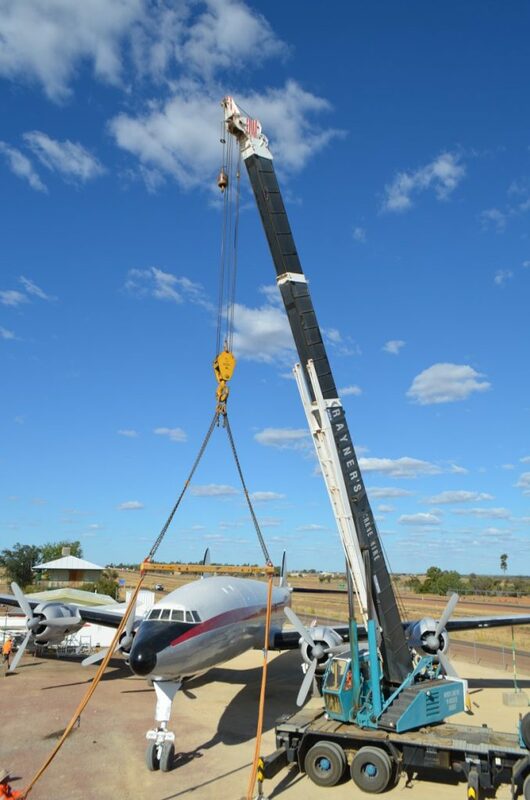 Such is the case at the Qantas Founders Museum at Longreach in Queensland, Australia. 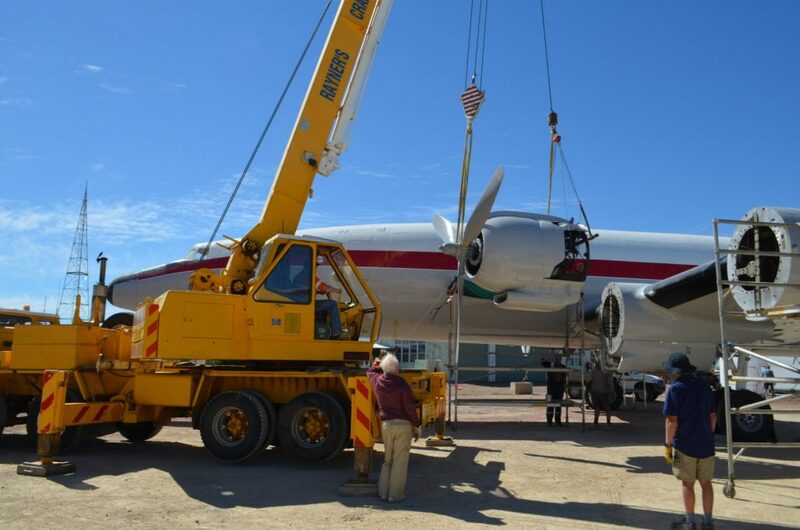 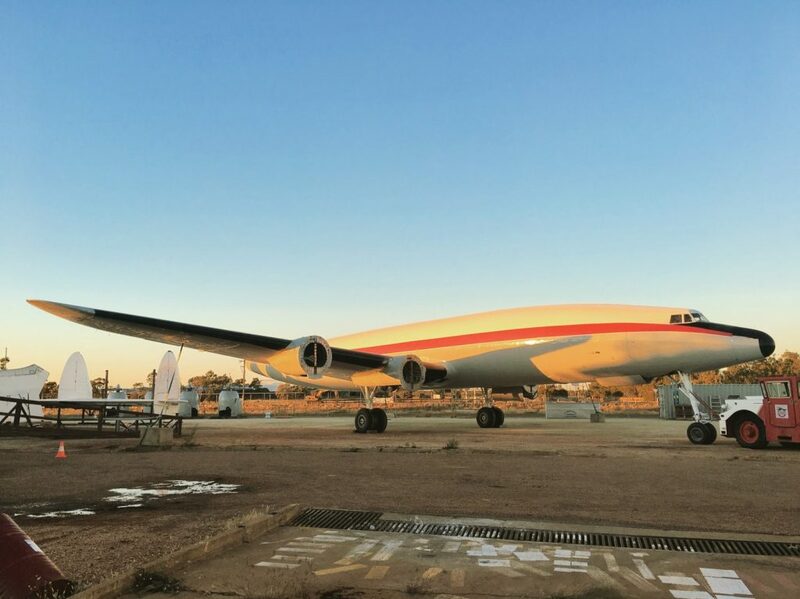 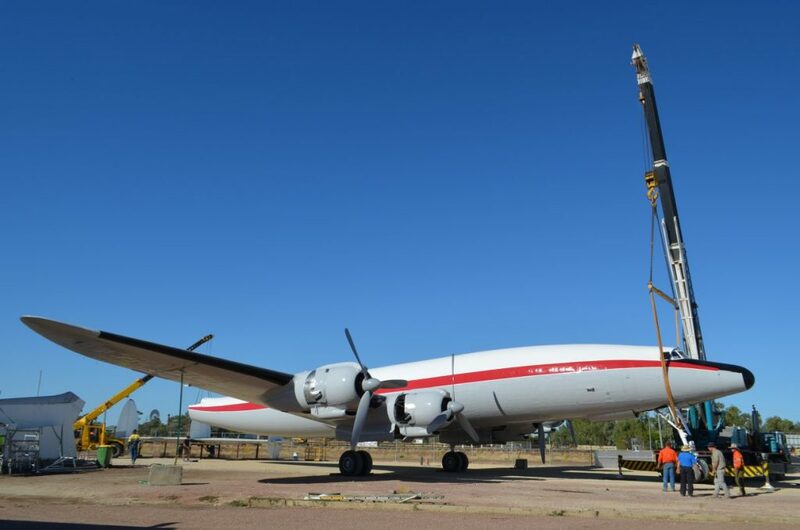 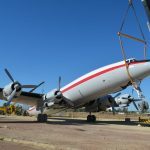 The museum acquired a long derelict Lockheed Super Constellation (former U.S. Navy C-121J Bu.131643). 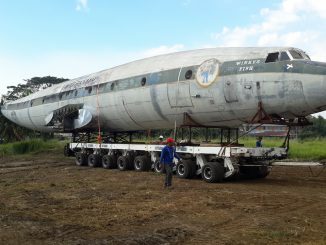 They recovered the forlorn airliner in the nick of time from Manila Airport in the Philippines, where it was likely about to get the axe. 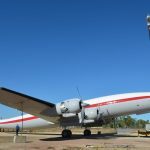 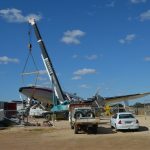 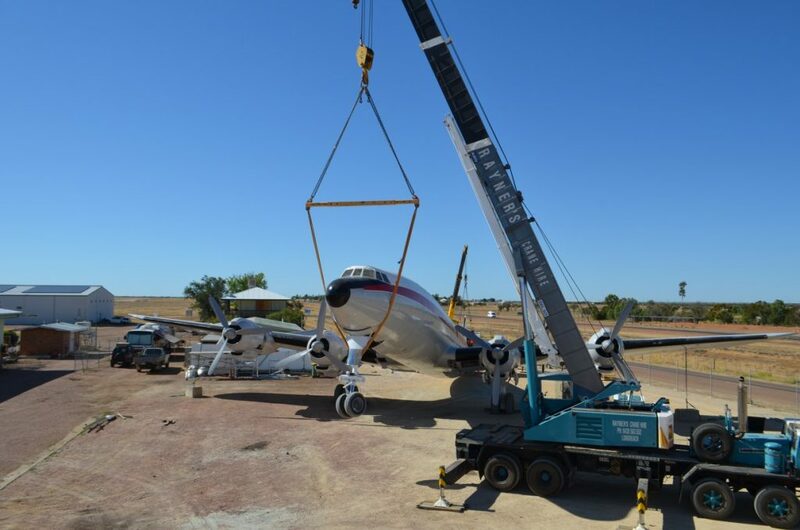 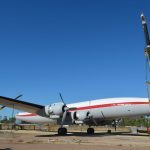 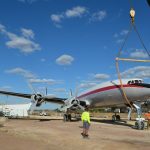 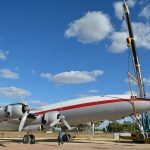 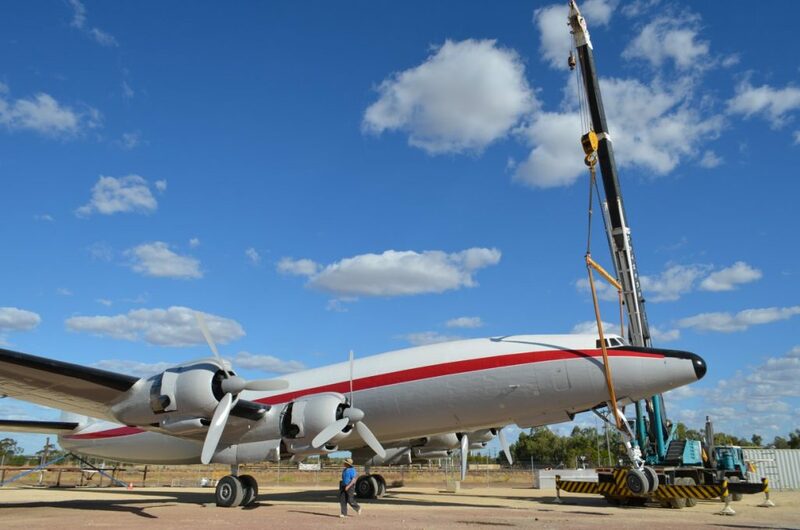 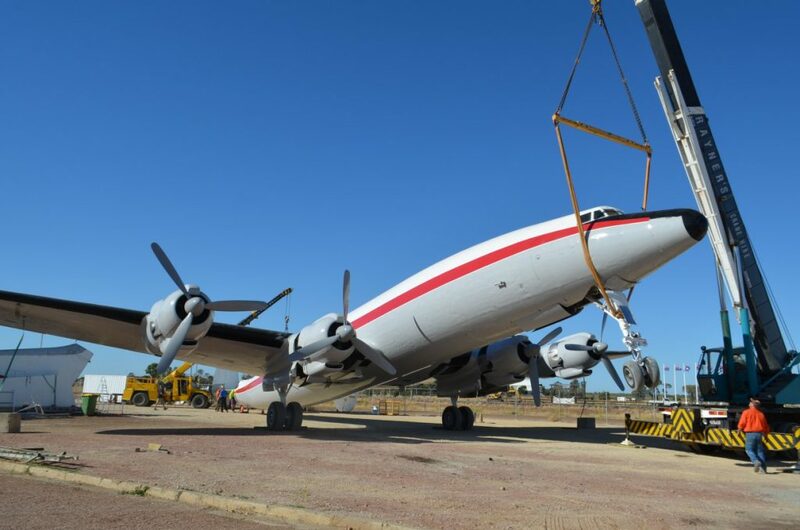 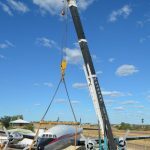 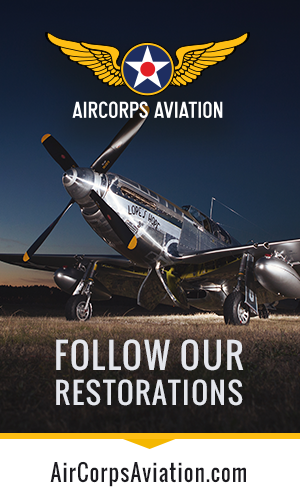 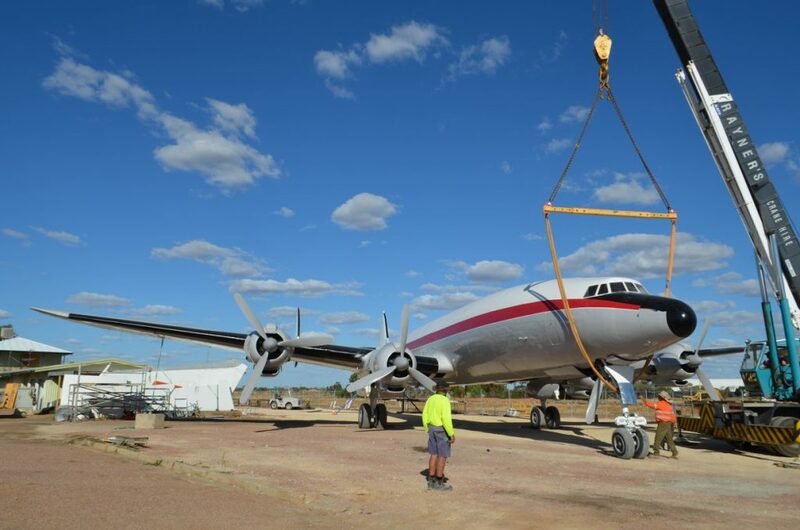 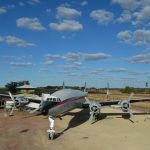 WarbirdsNews covered the museum’s efforts to bring her back to Longreach in a number of articles HERE. 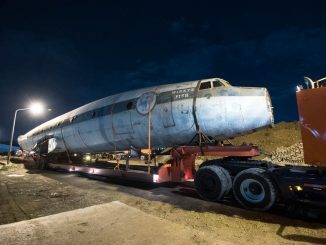 After a herculean effort, and the raising of significant funds, they managed to get her onsite in May, 2017…. 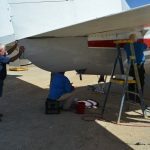 and they quickly got to work on digging deep into the airframe to clean out half a century of muck and corrosion. 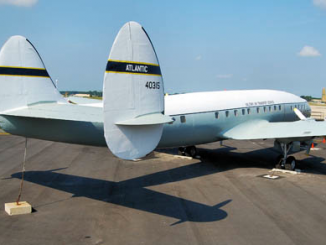 We received a report on where the aircraft stands now… and the transformation is incredible! 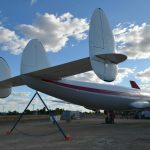 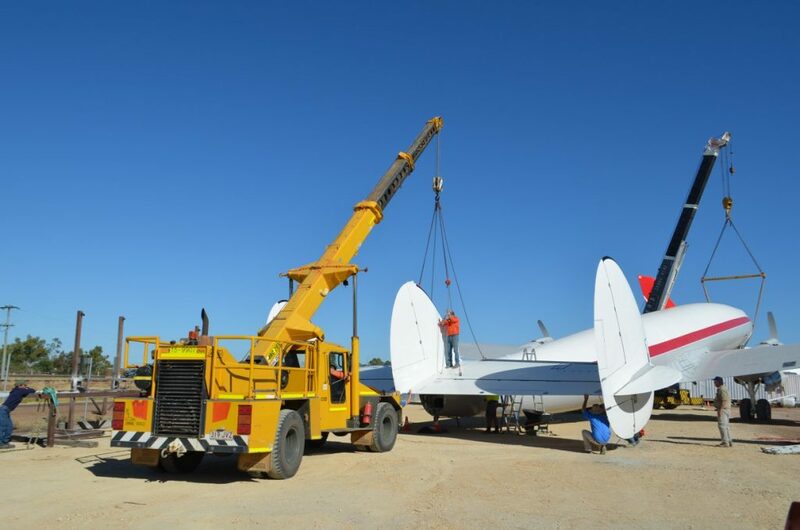 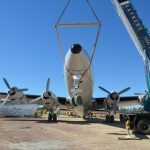 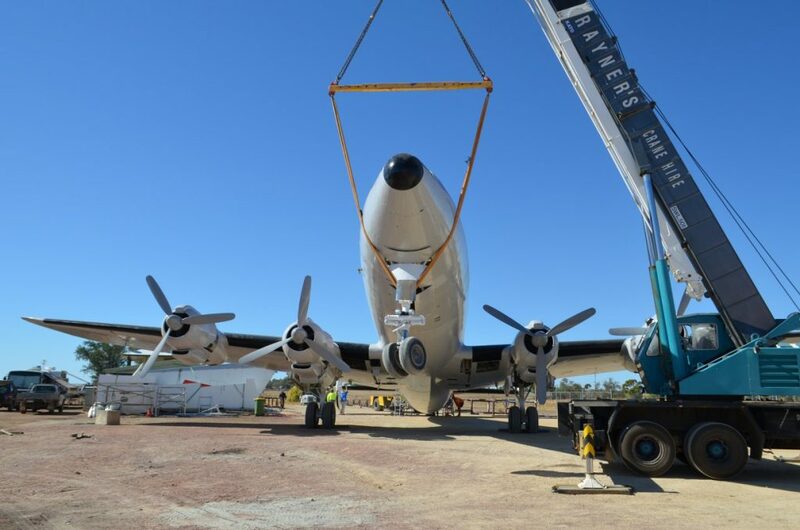 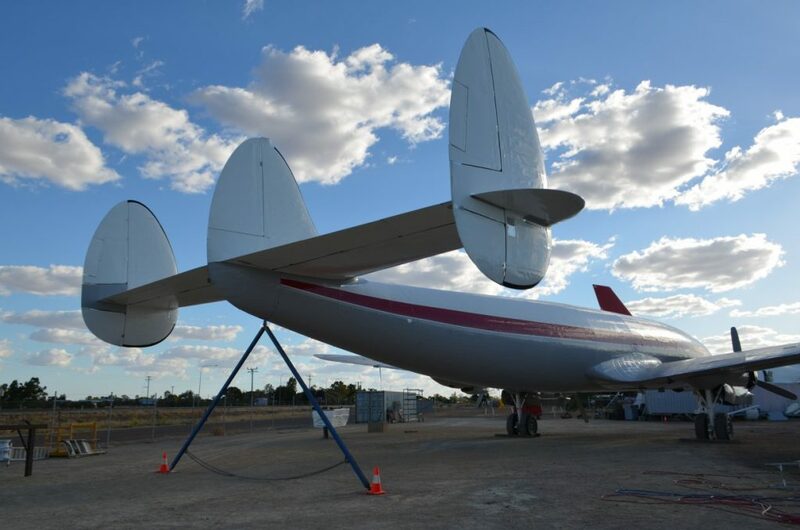 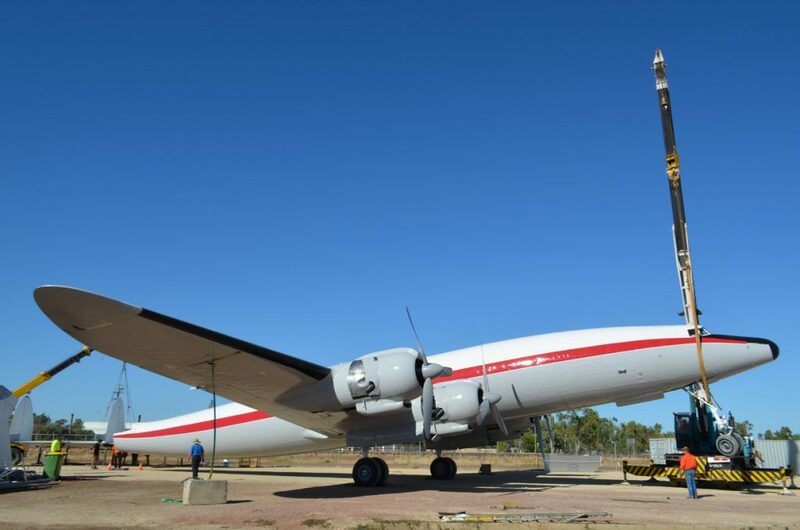 The preceding few weeks have no doubt been a tough and arduous period for our Super Constellation volunteers and Project Manager but the results speak for themselves with the aircraft now standing on its own ‘legs’ (landing gear) with its wings and engines attached as of Friday 25 May 2018. 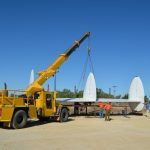 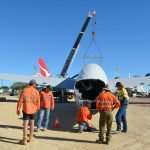 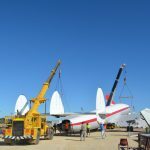 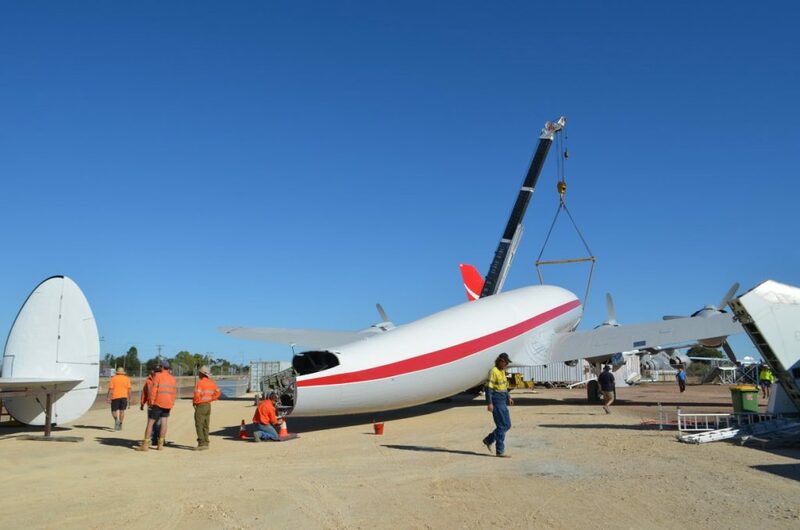 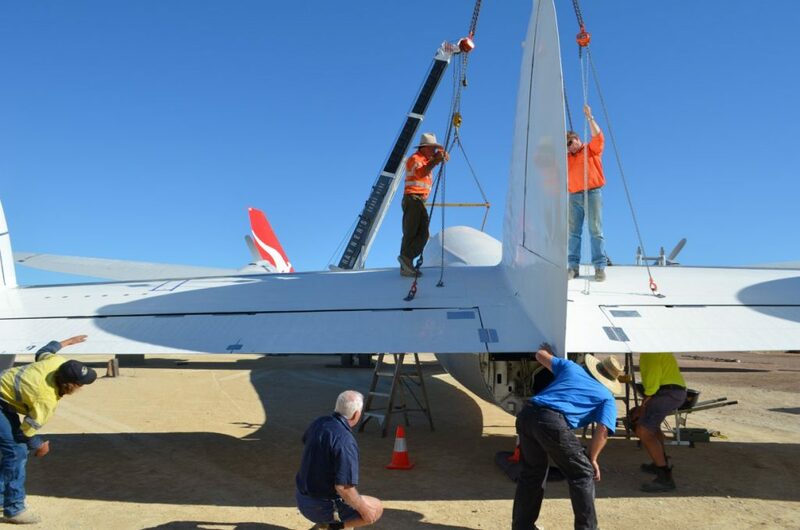 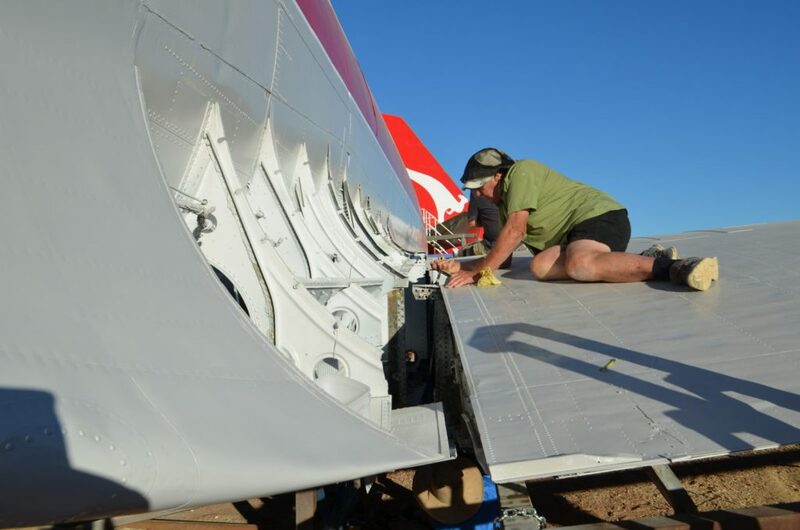 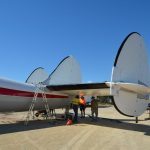 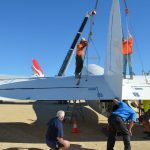 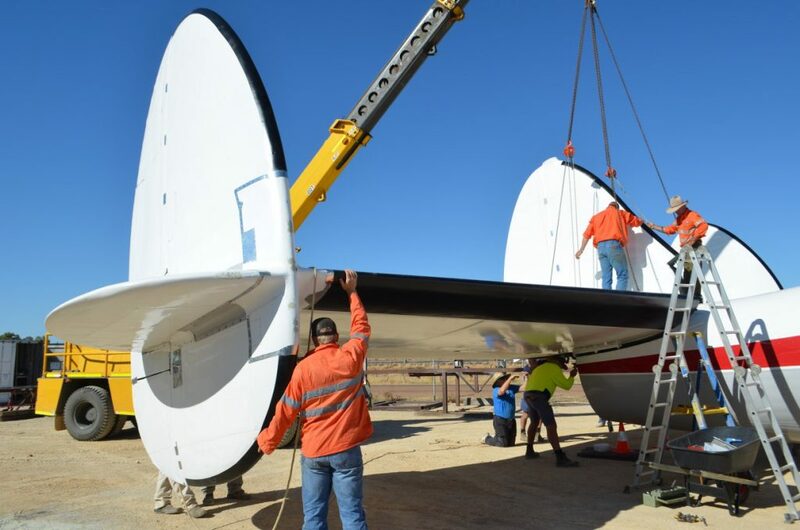 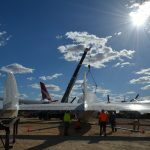 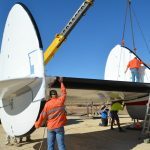 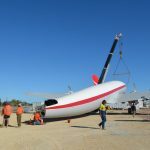 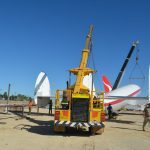 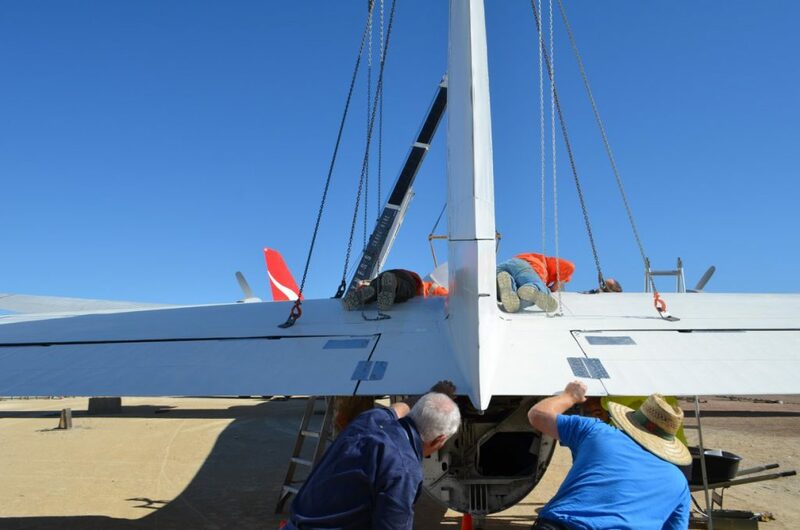 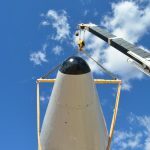 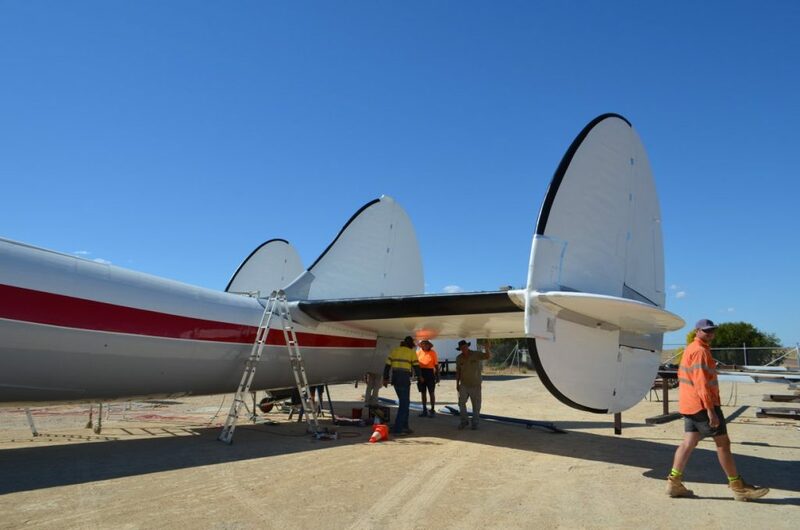 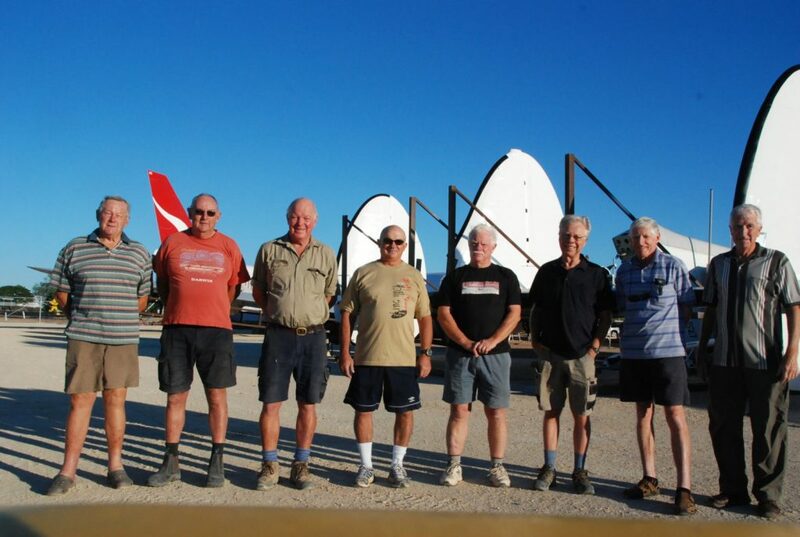 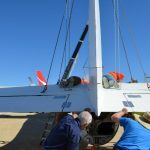 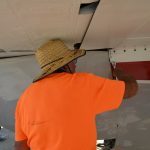 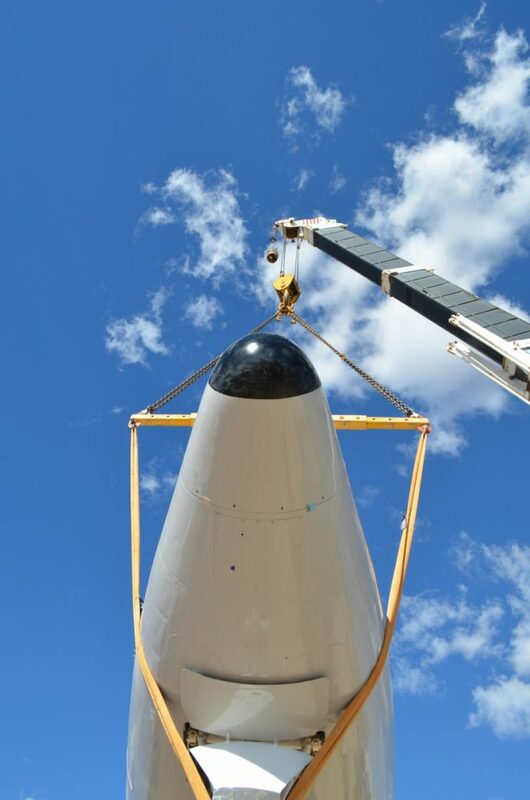 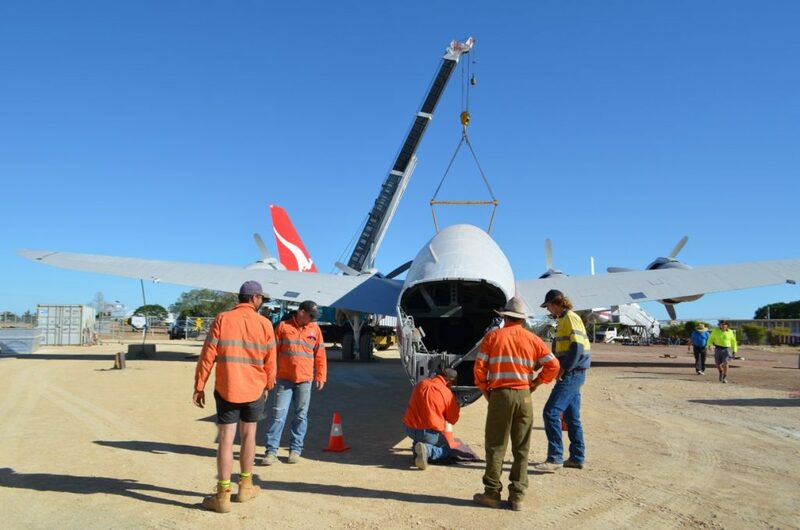 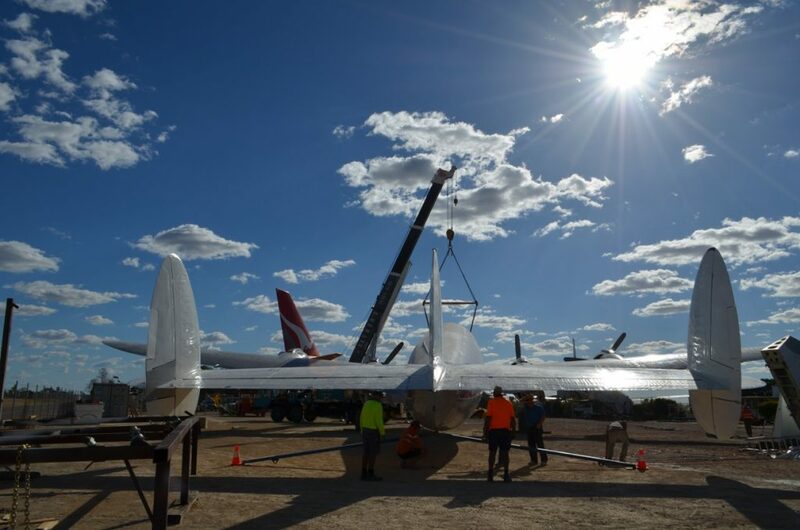 Assisted by a team of six committed Qantas Sheet Metal workers, the Project Manager and a small team of volunteers worked through late January to March preparing the aircraft structure and completing the first of over 200 necessary repairs. 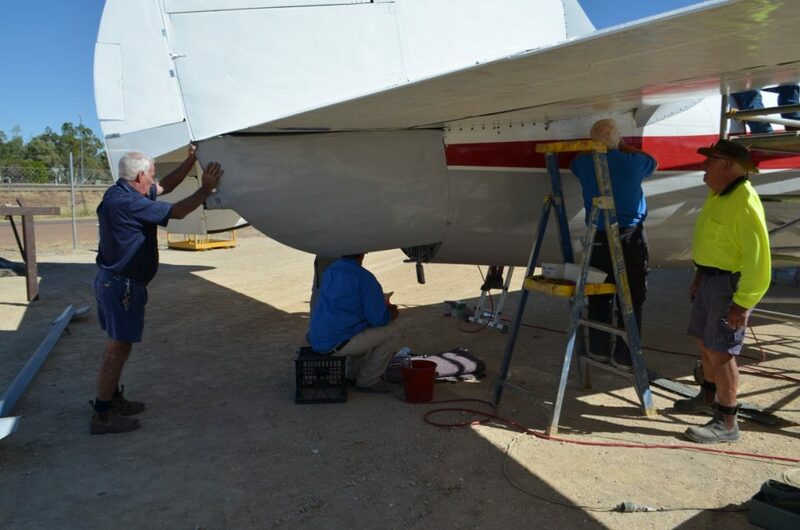 Following the old girl finding her legs again, the restoration team set about the arduous, not to mention tricky task of re-attaching the Connie’s massive empenage. 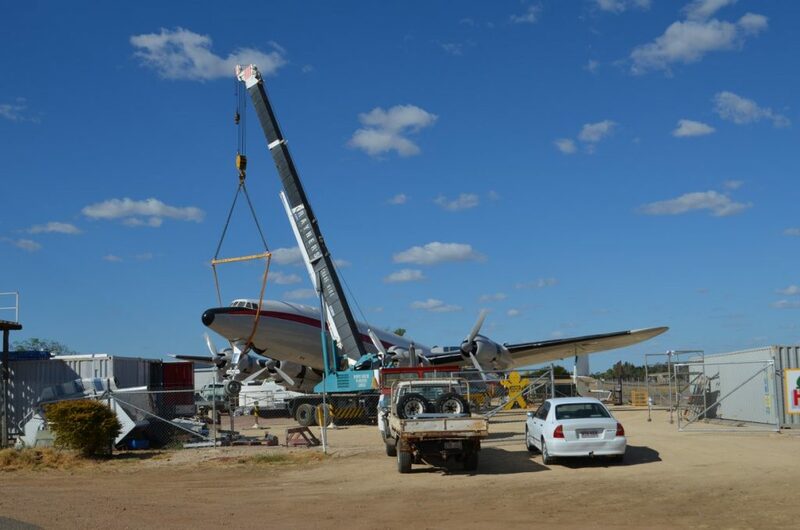 This they achieved by gently tilting the aircraft with a massive crane. 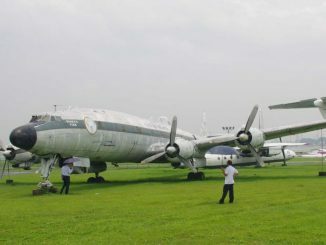 It is best explained through the series of photographs the museum took to document this momentous event on May 30th, 2018! 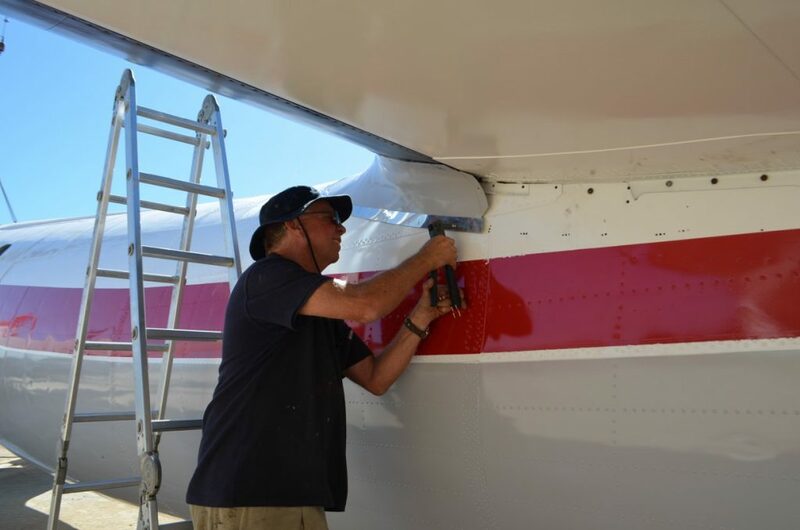 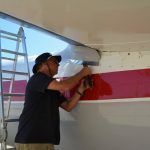 With the aircraft essentially whole again, at least externally, the paint team will revisit the aircraft this month to touch up the finish and apply her Qantas Airlines insignia and other detailed markings. 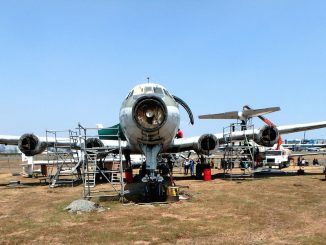 This should be complete by the end of June. 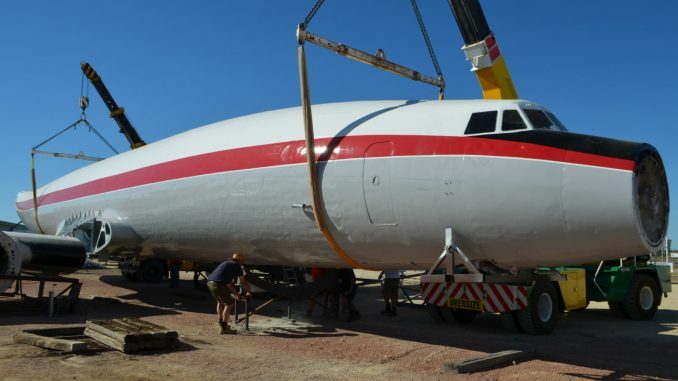 The next challenge will be to completely refit the venerable airliner with her interior furnishings and to create a suitable display for her, with the aim of completing these significant objectives by 2020, the year which marks Qantas centenary. 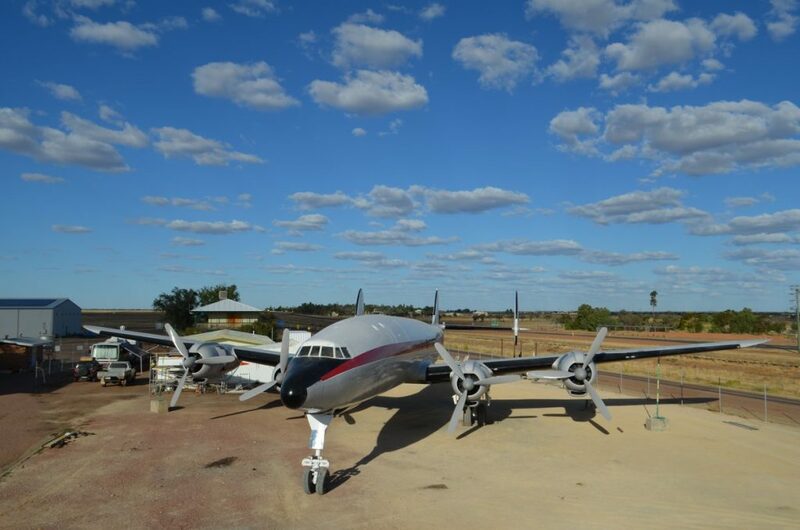 Qantas Founders Museum was initiated by the people of Western Queensland and is independent of Qantas Airways, although Qantas provides significant support in various forms, focused on the museum’s artefacts and their preservation. 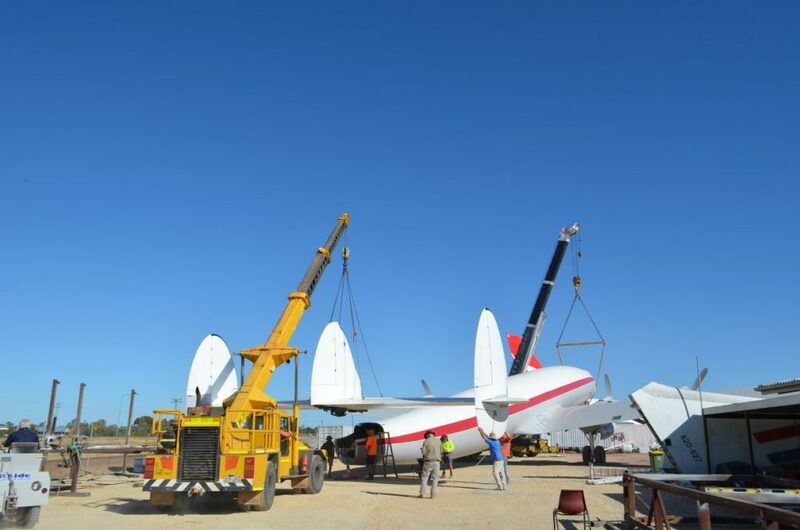 To donate to the museum and its projects, go to the Qantas Founders Museum website donation page at: https://qfom.com.au/donate-to-our-museum/ and follow the links or contact the museum by phone on: 07 4658 3737 or email: info@qfom.com.au.